We do not curently have theatre tickets available for Fascinating Aida This could be because we have simply sold out or it could be that this show is no longer running. The information on this page remains purely for historical and informational purposes. 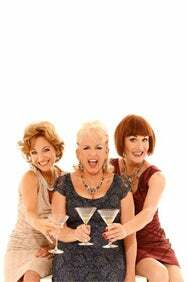 Dillie Keane, Adele Anderson and Liza Pulman. In London for nine nights only! In a fabulous Speigeltent in the middle of Leicester Square. With a selection of old favourites, songs you haven’t heard before and some you wish you’d never heard in the first place. The songs are mostly topical - the glamour unstoppable. With three Olivier Award nominations and 15 million YouTube hits for their Cheap Flights song how can you possibly miss them?